You can bill your clients by sending them Invoices. Invoices in Harpoon are very flexible and allow you to bill for hours worked, services performed, expenses incurred, products sold, or any other number of items you can dream up. 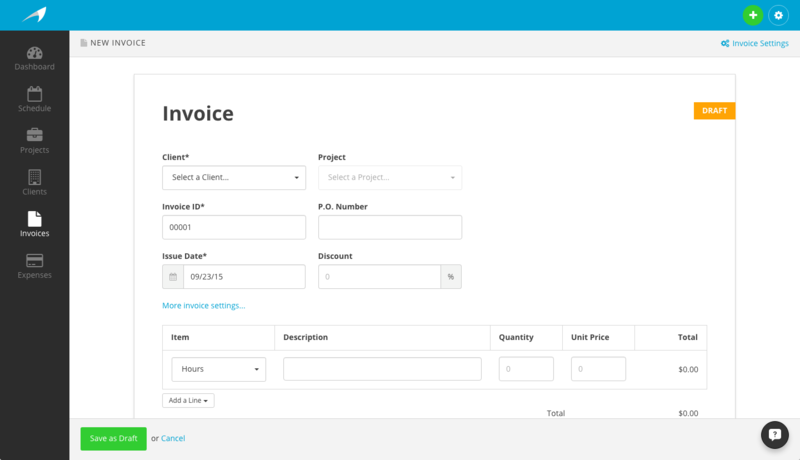 Creating an invoice couldn’t be easier. Click on the green Create menu in the top right of your screen and select New Invoice. You’ll now be presented with the New Invoice screen. Client: Select a client for your invoice. You can also choose to create a new client on the fly by selecting Create New Client in the drop down menu. To learn more about clients view the Clients support articles. Project: If this invoice is associated with a project select that project here.You can also choose to create a new project on the fly by selecting Create New Project in the drop down menu. Note: The selected project is for your internal organizational purposes only. Your client will be unaware of how you name and organize your Harpoon projects. To learn more about projects view the Projects support articles. Invoice ID: This must be a numerical value and can only be used once for an invoice. Harpoon will automatically increase the Invoice ID value by one for each subsequent invoice. For example, if you enter 00025 for your first invoice, Harpoon will automatically pre-fill 00026 as the ID for your second invoice. P.O. Number: If you need to associate the invoice with a purchase order number you can enter that here. Issue Date: This is pre-filled with the current date, but can be set to any date in the past or future. Discount: If you’d like to give your client a discount you can type in a percentage value here. The discount will be applied to the pre-tax subtotal of the invoice. Subject: This comes in handy when you want to summarize the contents of an invoice for your client. You can optionally choose to modify the invoices default settings by clicking the “More invoice settings…” link. Any changes made here will be applied to this invoice only. If you'd like to change your default settings for all invoices you can do so in your global Invoices settings. To learn more about invoice settings view the Invoice support articles. Now you can add line items to your invoice. Line items can be just about anything you want. You can start with a blank line item, or you can choose to add recorded hours or recorded expenses to the invoice as line items. To learn more about adding recorded hours to your invoice view the Time Tracking support articles. To learn more about adding recorded expenses to your invoice view the Expenses support articles. 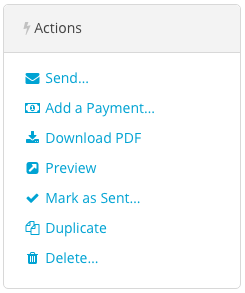 Once your invoice looks good click the Save as Draft button and you’ll be presented with the Invoice Details screen. Here you can take a variety of actions on the invoice, such as sending it to your client or adding a payment. To learn more about invoice actions and other invoice topics view the Invoice support articles.